Safety sealed packaging. 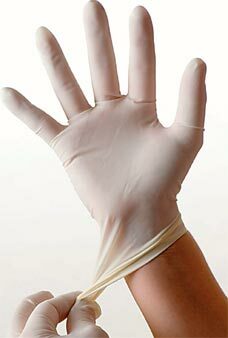 Premium quality latex gloves used in medical, dental, industrial, laboratory, food handing and more. Our quality latex exam gloves have gone through stringent inspection based on ISO 9001: FDA certification. Sold by the Case and Pallet. STORAGE: In storage avoid excessive heat 40° Celsius / 104° Fahrenheit. A open box of latex gloves should be shielded from exposure to direct sun or fluorescent lighting and stored in a cool dry place. Latex Gloves, AloeTouch Ice by Medline, 200 Gloves Per Box, Color Green, Latex Free and Allergy Free Gloves coated with aloe inside.